Basic Brewing Radio goes to Sake One! A two part video of SakeOne, the kura and sake. Part One, Jenifer introduces us to the sake brewery. She discusses the water, milling the rice and making the koji. Author WillPosted on January 8, 2010 March 8, 2019 Categories General Topics, Ingredients, Koji, Process, Rice, Water, YeastTags Koji, milled rice, Saké, Sake Yeast, SakeOneLeave a comment on Basic Brewing Radio goes to Sake One! 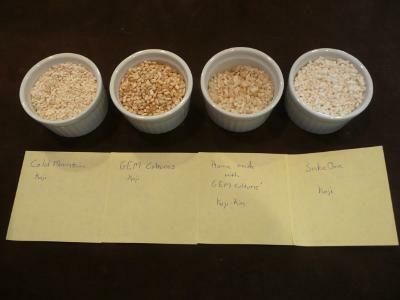 Compared Cold Mountain, GEM Cultures, Home made and SakeOne koji for sweetness, texture and appearance. I have been thinking about how different koji compare with each other. The most meaningful way would be to compare sake made from each. However, I can’t do this at this time so I decided to look at the koji itself. The koji I looked at are: Cold Mountain, GEM Cultures, home made koji from GEM Cultures’ Koji-kin and SakeOne koji. Both the Cold Mountain and GEM Cultures koji are quite dry and hard. When bit they are a little softer than dry rice but not by much. The home made and SakeOne koji are “fresher” and somewhat soft and chewy. Cold Mountain and GEM Cultures seem less sweet than SakeOne which much less sweet then the home make koji. Given the minimal fuzz covering of the home made koji, I was surprised it was by far the sweetest. This seems to indicate a healthy amount of enzyme despite the lack of fuzz. To check to see how much the dryness is effecting the sweetness, I soaked some koji from each sample. After soaking for an hour the water for Cold Mountain and GEM Cultures were a little sweet. The water for the home made koji was almost like syrup. However, the water for SakeOne was the least sweet. As for the koji itself, Cold Mountain was now the sweetest. GEM Cultures koji was noticeably sweeter but has a strong brand taste. Neither the SakeOne nor the home made koji seemed sweet any longer. Sake has four basic ingredients: rice, koji, yeast and water. Each play an important part in producing the taste, aroma and appearance. Each are discussed and how they come together to form the sake we love. Sake is made with four ingredients: rice, koji, yeast and water. All, except the koji, are familiar to most people. Koji is a mold culture grown on rice in the case of Sake. The mold is Aspergillus oryzae. It forms a white fluffy coating over the rice and excretes alpha-amylase which converts the rice starch into sugar. This is the primary function of koji in brewing sake; to provide enough alpha-amylase to convert most of the starch provided by the rice to sugar. Other compounds produced by the koji contribute to the final taste. This article discusses the best resources for learning to brew excellent Sake. There are a number of good resources for Sake Brewers but they aren’t always that easy to find and while looking you are likely to find some that may lead you down the wrong path. For the beginning Sake Brewer the two best resources are Fred Eckhardt’s Sake process and recipe or the pdf file and Bob Taylor’s Taylor-MakeAK site (no longer around). Both of these present a method of Sake brewing that is based on the traditional Japanese method and walk you step by step through the process. Prior to writing the above document Fred wrote Sake (USA) a book on Sake, and Sake Brewing. It actually covers more than just Sake and is a good general resource if you can find a copy; it has been out of print for some time. The best general resource on Sake, its ingredients, processes, people, well – all things Sake, is John Gauntner’s Sake-World. John comes at the topic as a connoisseur gone wild. There have been a few Brew Casters go off the beaten path to cover Sake Brewing. The first of these was from a couple of guys I thoroughly love to listen to, Graham Sanders and his sidekick Ian the cellar man. In their second July 2007 podcast they cover Sake and discuss a novel way of home rice milling which I have not tried – yet. The second podcast is also one I regularly listen to, Basic Brewing Radio with James Spencer. His November 29, 2007 episode is an interview with Bob Taylor on Sake Brewing. Yes, yes this is the same Bob Taylor as above. With just these few references, and you don’t need all of them by any means, you can learn to make Sake that is better than much of what you can buy and aspire to meet or exceed the quality of the best master Toji ( 杜氏 ). A new US Sake micro-brewer? Homebrew Sake – What Equipment do you need?